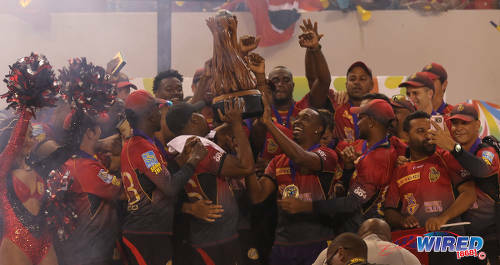 Photo: Trinbago Knight Riders players celebrate with the Caribbean Premier League cricket trophy after their three wicket win over St Kitts and Nevis Patriots at the Brian Lara Cricket Academy in Tarouba on 9 September 2017. That’s illustrious company for the Trinbago Knights Riders captain, who last weekend led his team to the 2017 title in the Caribbean Premier League. But on the basis of his performance as leader of the local franchise over the last few seasons, Bravo has earned at least a temporary place on that list. 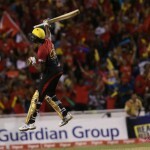 Bravo’s contribution to the TKR success is, I suspect, vastly underrated as illustrated by a comment which did not make the final cut in one of Roneil Walcott’s oh-so-people-centred colour stories; it attributed the TKR’s success not to Dwayne Bravo but almost entirely to Dame Fortune. There is no disputing that luck did play a part in the Knights Riders’ eventual triumph; after all, how often does a skipper win 11 of 13 tosses? How often does one batsman make 79 for 5 as Sunil Narine might be said to have done when he guided TKR past the Tridents at the Oval? 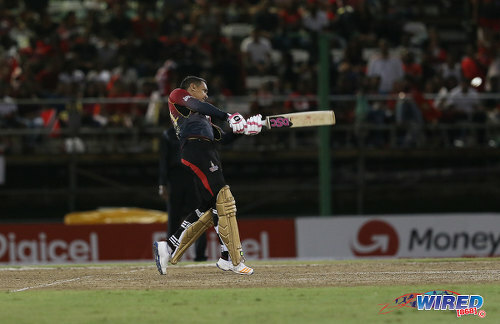 Photo: Trinbago Knight Riders’ Sunil Narine goes on the attack with the bat during CPL action against Barbados Tridents at the Queen’s Park Oval on 12 August 2017. How often will Roshon Primus put down a catch that one of Walcott’s people said scornfully his “lil sister coulda ketch…”? But luck, contrary to Walcott’s armchair pundit’s disparaging claim, was but one of the factors that helped Bravo’s side over the line. And it was emphatically not the major one. Because, as every Trini hunter knows, yuh could make track fuh gouti to run on but lappe does make he own track. Which is why, halfway through the round robin phase, Bravo’s TKR had already lapped the field. 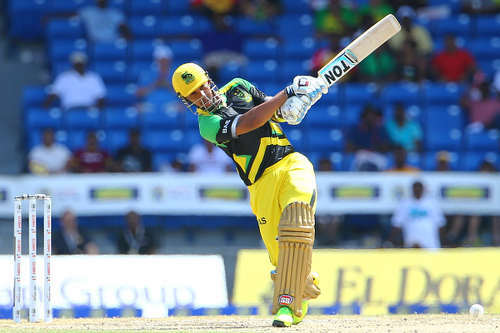 And why, at the end of the competition, while the Jamaica Tallawahs had three, the Guyana Amazon Warriors two and the St Kitts and Nevis Patriots and the Barbados Tridents one each, full four of the ESPN Team of the Tournament came from one side, the Trinbago Knight Riders. And, for those interested in these things, four foreign pros and an equal number from one Caribbean country, Trinidad and Tobago. On a side note, it is obvious that this team is merely meant to reflect the best individual performers but I would have omitted Pollard. For me, his explanation that he intended to bowl a short ball at Evin Lewis but inadvertently overstepped runs second only to Diego Maradona’s “It was the hand of God” for its brazenness. What, are we all blind, Kieron? Were the boot on the other foot and someone had bowled a no-ball at the Tridents skipper in similar cicumstances, there is, I think, a good chance that that would not have been the end of that. 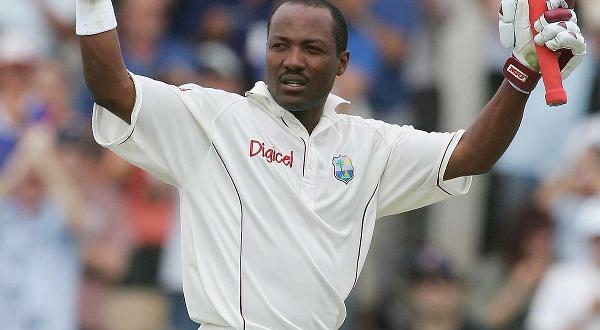 And, of course, Bravo, not Kumar Sangakkara, would be my skipper. Sanga’s sharp too but Bravo really has it down to a science. I illustrate. There was a moment in one of the three matches the TKR played at the Lara when, after a break, Yasir Shah was all set to bowl the next over. I have no idea what Bravo saw or heard or sensed but he stopped the Pakistani in his tracks and gave the ball to Narine. Not for the first time, the eleventh-hour decision paid rich dividends. Narine got his man second ball, I think. 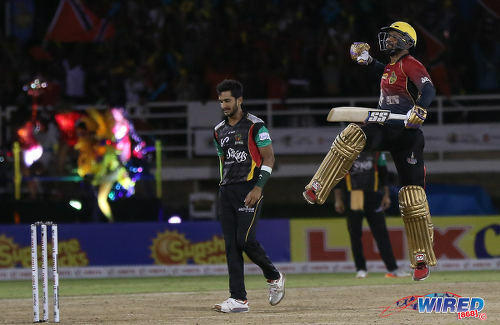 TKR won by seven wickets. Back to luck. With the benefit of hindsight, I would argue that, for the TKR, losing to the Patriots in the Play-off was also a stroke of luck. 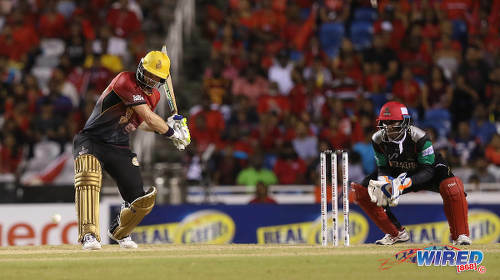 Of course, it was no more than TKR deserved after the unfortunate loss of their rock-solid opener, Brendon McCullum, in the last round robin match against Pollard’s Tridents at Kensington Oval. But it was a stroke of luck because it allowed the McCullum-less team to make vital mental and other adjustments—self-belief?—in the second eliminator that stood them in good stead in the final. I would argue too that the jet-lagged Dan Christian’s splendid, flying, one-handed catch in Tarouba was a massive stroke of luck. 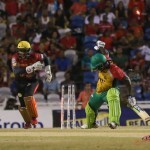 Not because it was responsible for the dismissal of the pugnacious left-hander who could—and did against the Tridents in Barbados—single-handedly take the game away from any opposition but because it raised the fielding bar for the TKR much higher than Bravo and McCullum would have dared set it. And because, after the Robert Frylinck disaster, it restored confidence in the judgement of the management. 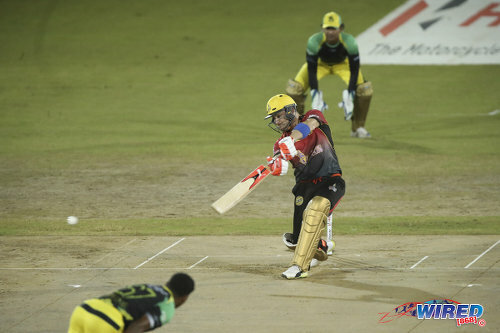 Photo: Trinbago Knight Riders opener Brendon McCullum drives at a delivery from Jamaica Tallawahs bowler Krishmar Santokie during CPL T20 action at the Queen’s Park Oval on 9 August 2017. Luck, however, was certainly not the major element contributing to the team’s well deserved victory; the major element was teamwork. And I am prepared to identify five other contributory factors, namely astute captaincy, complete clarity on individual role and function, a hugely supportive home crowd, Bravo’s massive self-confidence. And McCullum, present or absent! In a sense, the last two have to be taken together. By Bravo’s own oft-repeated admission, the former New Zealand captain with vast cricketing experience and knowledge is a massive influence on the team. Although Bravo remains indisputably the captain, discerning eyes can tell that, in a real sense, the team leader is the Kiwi. If, however, Bravo perceives McCullum’s stature and influence as somehow undermining or even threatening his own position, he does a very good job of not letting it show. And it’s not just McCullum. 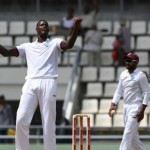 Denesh Ramdin, a former national, West Indies Under-19 and West Indies skipper, often makes adjustments to the field—with no hint of reproof from the official captain, who remains, in spite of the potential for captaincy by committee, firmly in charge. Photo: Trinbago Knight Riders batsman Denesh Ramdin celebrates after scoring an unbeaten 59 runs in an exciting four wicket win over the St Kitts and Nevis Patriots in CPL action at the Queen’s Park Oval on 14 August 2017. Two examples must suffice. Maybe there is a Knight Riders off-the-field brain trust—neither Bravo nor McCullum can be excluded—but the nature of T20 cricket, which Bravo understands, in my view, better than any of the other captains on show, negates the effects of long-term planning. 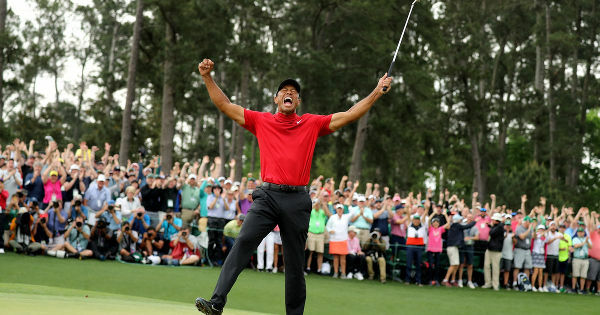 When tactics trump strategy, it is the captain who can think on his feet and make late decisions and last-minute adjustments that will win the day. So I give the skipper full credit for persisting, despite persistent criticism, with Sunil Narine at the top of the order and for moving himself to number three in the final, when he was not at his physical best. That the Knights Riders are the champions despite Narine’s consistent failures as pinch-hitter and the skipper’s golden duck in that crucial game, as far as I am concerned, are proof that the TKR made the right choices. Which brings us to teamwork. One can count seven different batsmen who played major match-winning knocks in the ten victories TKR notched up this season. And the stark contrast between the roles some of them (Darren Bravo, Colin Munro, Denesh Ramdin) played on different nights leaves no doubt about their complete commitment to team and their understanding of what is required of each of them in any given circumstance. The T20 format is not so much about formulae as about flexibility, not so much about patterns as about unpredictability, not so much about occupation of the crease as about optimisation of your current, constantly changing circumstances. And both the fluid intra-team roles—Narine’s as pinch-hitter is an exception, which proves the rule—and Bravo’s completely unpredictable use of his bowlers—not so his insistence on bowling the last over—is incontrovertible proof that he better than any has achieved near complete mastery of the internal workings of the format. Finally, a word about the scheduling and the crowd support. Except for the first eliminator, (in which the home team were not involved), attendances in the T&T legs were excellent. One might argue that, without the team’s continuing success, the picture might have been less rosy. I’m not at all sure. Photo: A TKR fan enjoys his team’s performance during CPL action against St Lucia Stars at the Queen’s Park Oval, Port of Spain on 7 August 2017. What is certain—and Bravo and Ramdin kept drumming it in our heads—is that the crowds both at the Queen’s Park Oval and in Tarouba were actively supporting the TKR even when things looked brown. I think the CPL organisers should take cognisance of that. Now I know that Messrs Rowley and Imbert have been reminding us incessantly that the government has no money. 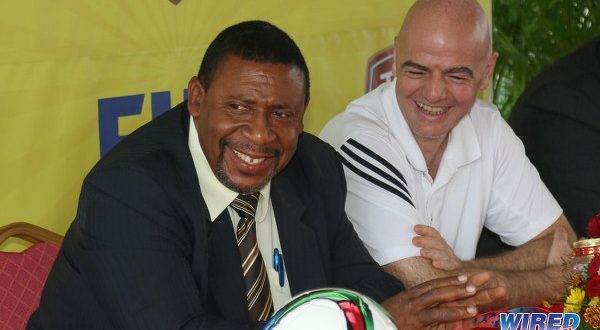 In fact, those who, like the local football pros, have been depending on the Sport Company for sustenance are now struggling to stay afloat. But, as every UNC supporter knows, Gopaul luck is not CPL own. 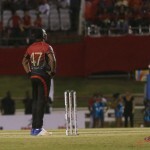 So really, I think the Government of Trinidad and Tobago should be seeking to conclude an agreement with the CPL to use the Brian Lara Stadium for the finals every year. It’s a fine facility which is the right size for T20 cricket with a pitch that permits stroke play and an idyllic setting that facilitates the creation of a splendid party atmosphere. 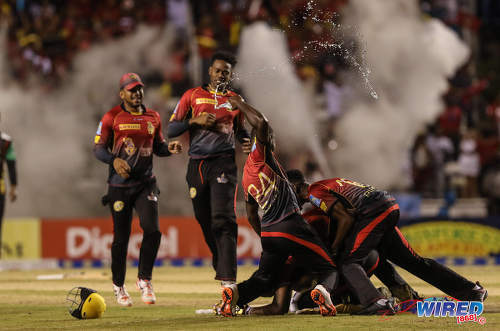 Photo: Trinbago Knight Riders players surround teammate Kevon Cooper after his decisive role in their three wicket win over St Kitts and Nevis Patriots in the CPL final at the Brian Lara Cricket Academy in Tarouba on 9 September 2017. So, what a collaboration! What a combination! 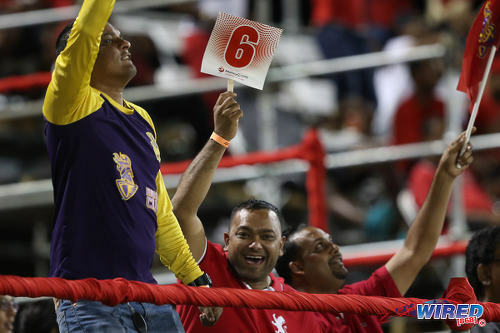 The best and biggest party in T&T—no sport!—working to stage the biggest party in sport annually at the T&T “home” of arguably the biggest party-er in sport. 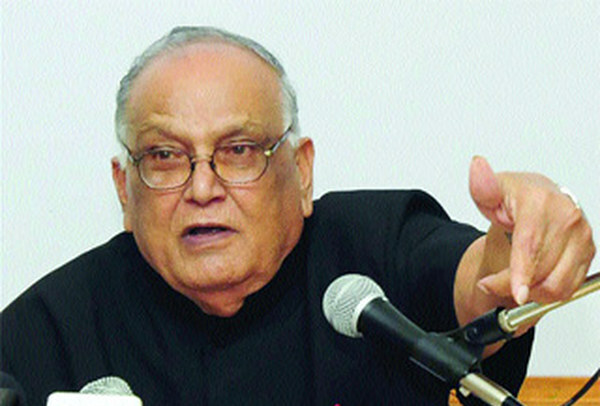 It sells itself—although the PNM will most likely bungle it. 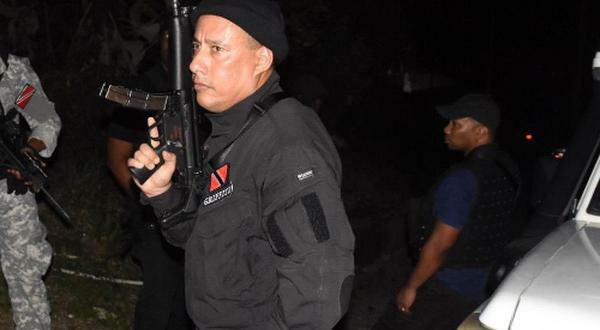 Still, in theory, even in a TKR off-year, with Ravi B or Machel or Kes or, in a good calypso year, Destra as an additional drawing card, that line has the potential, I submit, to give all of Tarouba, indeed, all of T&T, sleepless (K)nights. Evin Lewis, Brendon McCullum, Chadwick Walton, Kumar Sangakkara (captain), Andre McCarthy, Kieron Pollard, Dwayne Bravo, Sunil Narine, Shadab Khan, Sohail Tanvir, Kesrick Williams. Mouth watering content. Thanks for smile.